Here we are at Ryan’s 1st birthday. And its been a fun-filled year for both the youngster and his family. It’s remarkable just how much a child changes from a tiny, helpless miniature human into a crawling, babbling smile machine. There’s no need to go into the details of his year of growth (read a baby book for that – its more or less the same), so let’s see what we’ve gotten out of a year’s development. We had always said that Sean (Ryan’s big brother) was mellow. Not too bothered by his surroundings, not very problematic when it came to things like bedtimes, meals, and diaper changes. But then the terrible twos hit with a vengeance, and he’s far more emotional and frustrated by his inability to communicate what he really wants. Meanwhile, Ryan has shown us the true definition of mellow. He’s easygoing, likes to play on his own, but still wants to get into his brothers (and mother’s and father’s) business. His cute baby cry has, unfortunately, been replaced with a fairly loud and aggressive cry, but this has been offset by a delightful giggle that is almost too easy to elicit. He’s goes down to bed without a fuss, and he sleeps through the night (while Sean has reverted a bit and will occasionally wake up with a yell in the wee hours). 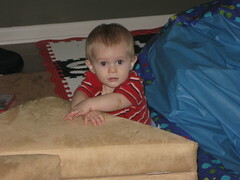 And he is quickly picking up on lots of things, like stacking blocks or holding a spoon or clapping and patting. Right now he’s at the cusp of walking (he’s “crusing” a lot: Walking along a wall or cabinet), and he’s got the rudiments of words working (including a very rough “daddy”). Here’s hoping that Sean has taken enough terrible twos for the both of them and Ryan maintains his mellow streak!